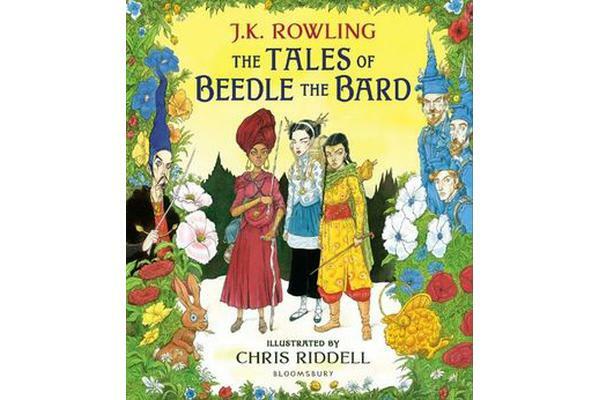 An essential companion to the Harry Potter books and a magical gift for all Harry Potter fans, The Tales of Beedle the Bard is a collection of fairy tales from the Wizarding World, with wise and witty notes from Professor Albus Dumbledore (via the enchanted pen of J.K. Rowling). 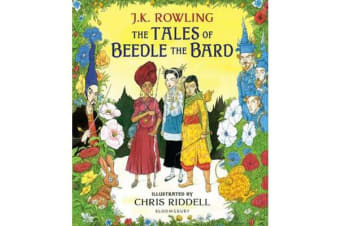 Multi-talented Muggle illustrator Chris Riddell makes this book a complete visual treat, the pages bursting with glorious colour, beautiful line and stunning composition – with some familiar faces from the Harry Potter novels themselves popping up in the deliciously original and subversive Dumbledore’s notes. Packed with colour illustrations and a spectacular gatefold spread, this follows the globally bestselling illustrated editions of the Harry Potter novels (Jim Kay) and Fantastic Beasts and Where to Find Them (Olivia Lomenech Gill) as an absolute must for fans of all ages. Mischievous and witty, the five rollicking tales are a deeply satisfying read in the tradition of all great fables and fairy tales. Kindnesses are rewarded and selfishness shown to be the ruin of many a wizard. Burping cauldrons, hairy hearts and cackling stumps are met along the way. Each tale is brought vividly to life with Riddell’s trademark humour and elegance, including `The Tale of the Three Brothers’, familiar to readers of Harry Potter from the crucial role it played in Harry Potter and the Deathly Hallows. Joining the hand-picked band of illustration talent lending their own magic to the world of Harry Potter and Fantastic Beasts, former Waterstones Children’s Laureate Chris Riddell is the only illustrator to have won the Kate Greenaway Medal three times, and is brought together here for the first time with one of the world’s best loved storytellers in this new edition of J.K. Rowling’s fairy tale classic. Much loved by generations of witches and wizards since they first appeared in the fifteenth century and translated from the original runes by Hermione Granger, this beautifully illustrated edition is set to become a firm favourite at bedtime in non-magical households the world over. The Tales of Beedle the Bard is published in aid of Lumos, an international children’s charity founded in 2005 by J.K. Rowling.